The reward for capturing every contact you do business with is in being able to analyse, profile and harness the wealth of information collected over time. ContactsLaw’s rich Client Relationship Management (CRM) features let you use that information to drive marketing campaigns, generate repeat business, identify your most valuable clients and much more. Specialised contact types, industry groups, addresses, prospect details and customisable tags make it easy to build lists of contacts, which you can use for mass mail-outs and other forms of targeted marketing. Naturally, you can measure their effectiveness using the same tools that led to their commencement. ContactsLaw also ships with features to import contacts from other systems, including communications/business/productivity software, online services – even your firm’s website†. † ContactsLaw includes a software development kit (SDK), which allows third-party developers to interoperate with – and extend the functionality of – the system. ContactsLaw’s CRM features don’t end with simply being able to query and extract information from the system; as you apply that information to conducting marketing activities, ContactsLaw is there to help you gauge the effectiveness of your efforts. Referral sources provide a mechanism for tracking the origin of business, and allow you to evaluate the success (as well as the value) of marketing campaigns. Whenever you gain a prospective client or create a contact’s first file, you add the appropriate referral source, building long-term statistics. Similarly, by reporting referring contacts, ContactsLaw helps you identify those people who generate word-of-mouth business, and determine whether you are delivering a level of service that encourages this type of promotion. Admin files offer all the functionality of client files; you can store and generate documents, record activities, model important contacts and more. However, they can be excluded from time recording (or record zero charges) and are grouped separately in billing and performance reports. Access to admin files can be controlled via permissions. 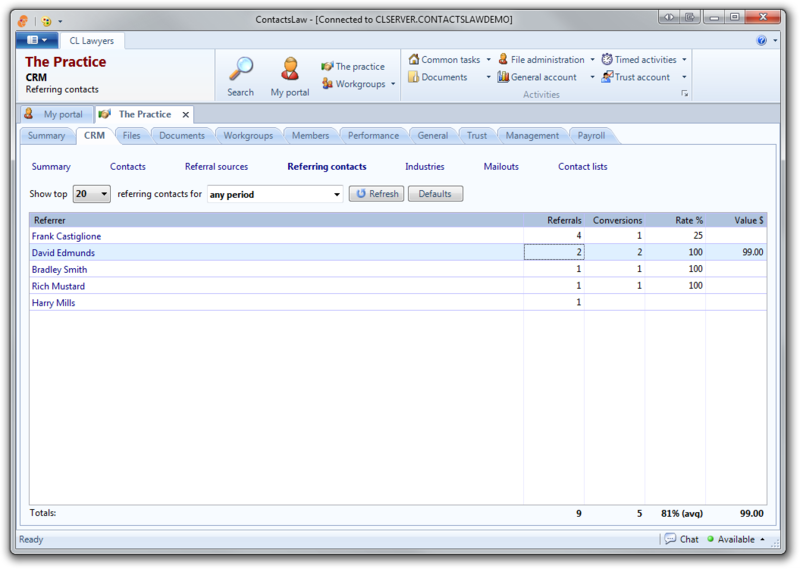 ContactsLaw also offers features to better manage non-file administration; you can register documents to contacts (such as creditors, banks and subsidiary companies) and link supporting documentation (e.g. bank statements, invoices, etc) to your electronic records. 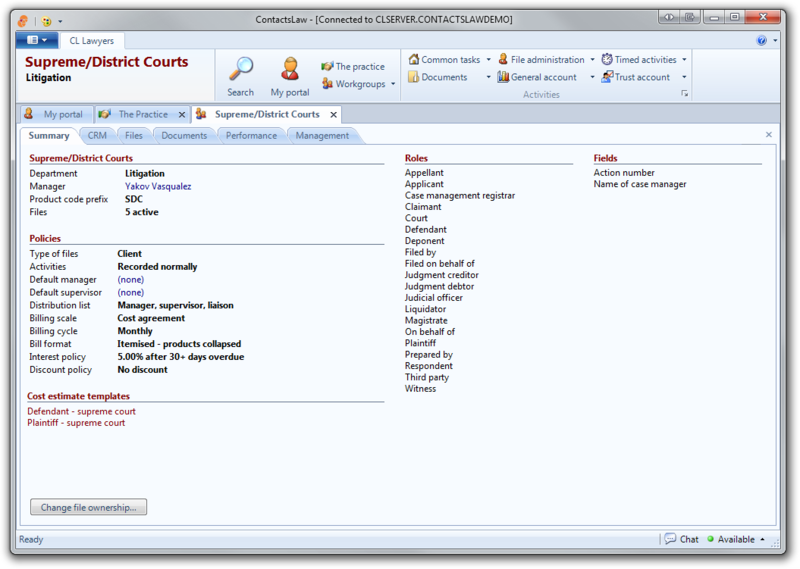 ContactsLaw also gives you the power to monitor and manage your practice in real-time: File lists keep you up-to-date with the state of the matters you manage or supervise, determining when to bill and indicating when management action must be taken. Throughout the day, you can watch your staff generating billable hours as they record activities. ContactsLaw isn’t just a solution for a single practice. If you operate a service company or other entity (such as a superannuation fund or trust), then you can bring all the benefits of ContactsLaw to those subsidiaries as well. Each subsidiary company you configure has its own chart of accounts, organisational units, files, activities and documents. You share a common pool of contacts and members. You can generate performance reports on a per-company basis, or view your aggregate performance from the portal. Access to subsidiary companies is controlled via permissions, allowing you to assign responsibilities within one entity separately from your practice (and from any other subsidiaries). ContactsLaw is a dynamic, highly-customisable system; its activities conform to the way you do business, not the other way around. Each activity breaks down into steps – you choose how many discrete steps are required and which member(s) are responsible for completing them – this forms the workflow for the activity. You can control how each step is charged; whether the time spent performing it should be automatically recorded, or if a fixed charge applies. 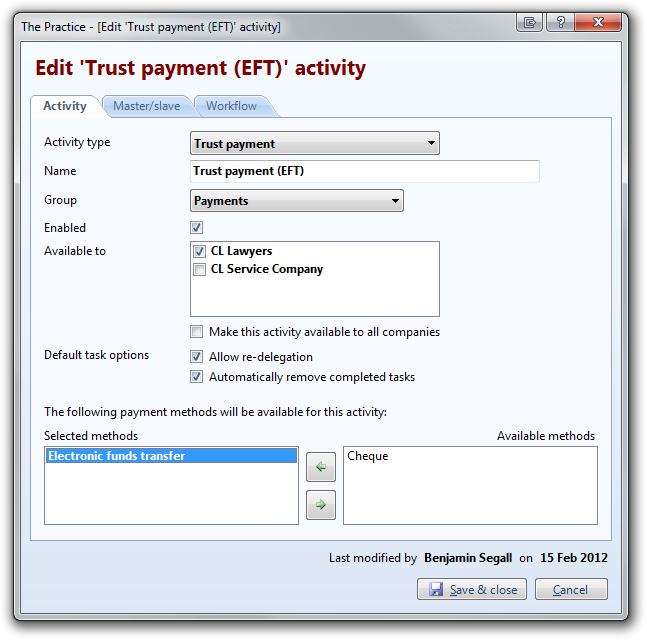 You can split or clone activities to model different scenarios; for example, since the business processes associated with receipting money differ according to the method of payment, you might define separate workflows for funds received by EFT and those paid by cheque. In defining a workflow, you can add arbitrary steps to represent manual processes that occur outside ContactsLaw. You can even develop completely user-defined activities. When a member completes one step of an activity, a task is automatically sent to member(s) responsible for completing the next step, and so on – you can also create tasks manually. Members can prioritise, narrate and delegate tasks to facilitate their time management. Finally, with document workflows, you can customise the processes associated with registering, authoring, finalising and sending documents. This incredibly powerful mechanism allows special types of documents to instigate a chain of activities, sharing information between them. You can build letters that generate follow-up tasks, mandate a review process for certain types of documents, or draw information from other activities to save time and better describe incoming documents. Although a law firm can never be a truly paperless office, ContactsLaw is designed from the ground up to help you reduce your reliance on paper; internally and in communication with clients, other parties and courts. 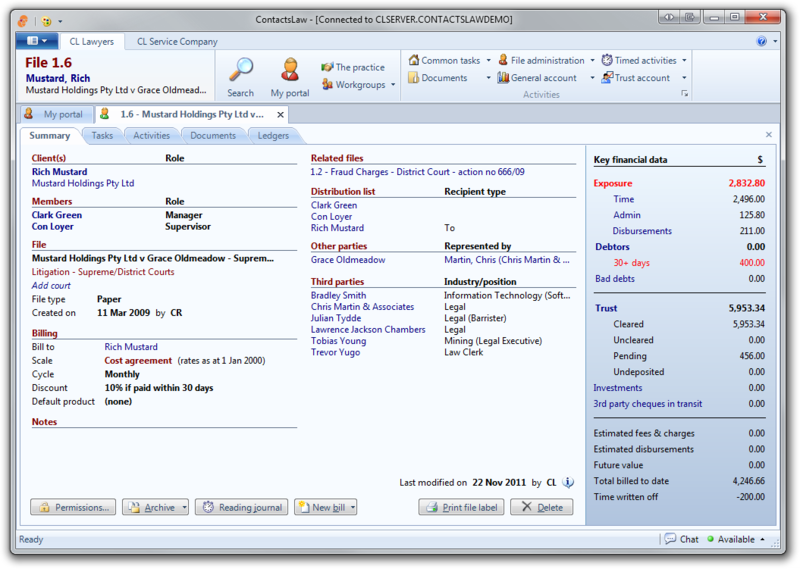 With ContactsLaw, you can choose to operate wholly electronic files. On each file, electronic records for time, file notes, bills, general & trust transactions – combined with electronic copies of all documents – build a complete picture of the matter. This enables you to effectively manage the matter without the need for a traditional paper file. Through dedication to scanning and registering incoming documents into ContactsLaw, you retain less paper, and save on photocopying by distributing copies of documents electronically. With support for electronic signatures, it’s no longer necessary to print documents simply for the purpose of signing them. Furthermore, you can achieve the fundamental security principle of non-repudiation when exchanging documents by using ContactsLaw’s on-the-fly PDF conversion features. Finally, the ability to develop e-mail templates to the same standard as you would for letters further enables the move to electronic forms of communication. 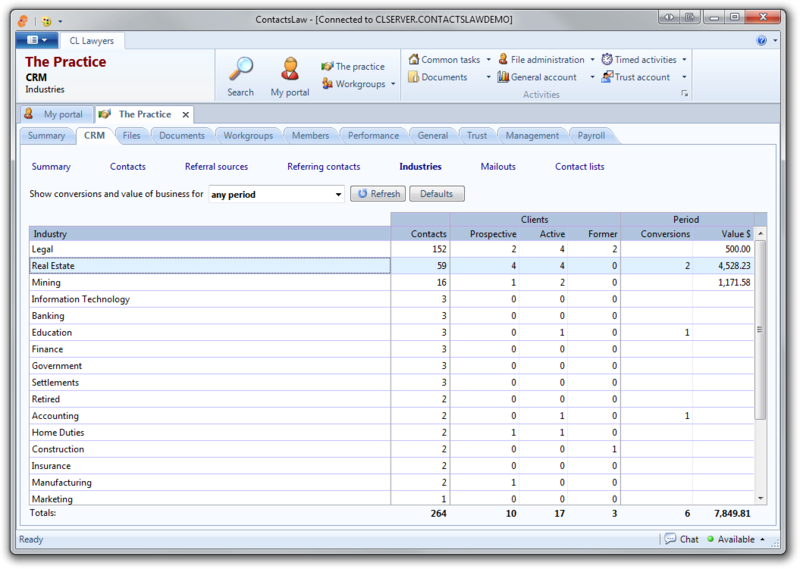 Most reports in ContactsLaw are presented interactively, within the software. In many cases, reports in this form are actually more powerful and of greater use than their printed counterparts. Of course, ContactsLaw allows you to print any report, but you also have the option of sending reports via e-mail or exporting them as electronic documents. With ContactsLaw, you’ll also use less paper when communicating with your staff. Tasks and workflows more accurately model the way you do business, and provide a conduit for communicating with other members about day-to-day activities. Payslips and superannuation advice are delivered electronically to your staff, printable on-demand.